Security administrator, U.S. State Department, Washington, D.C. Interested in both law and the military as career options, Shanell chose criminal justice and political science majors. 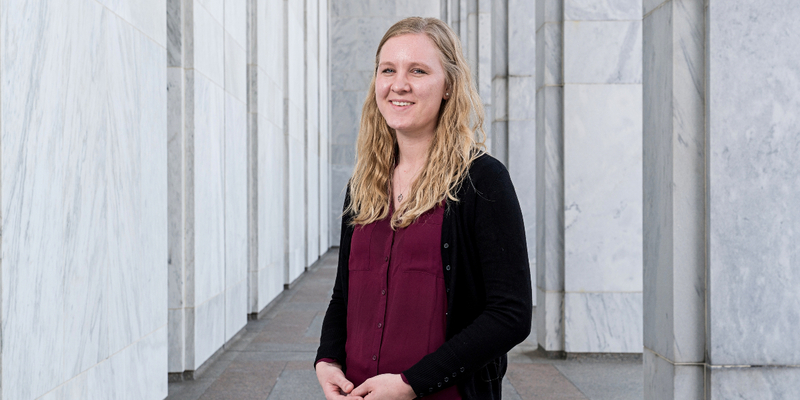 She studied in the capital her final semester, participating in the American Studies Program and interning at the U.S. State Department. Now she has a government job in the State Department's Bureau of Diplomatic Security. Why did you double major in criminal justice and political science? I've always had a passion for truth and justice, and I strive to bring more of it into the world. It's incredibly challenging and rewarding. Discovering the relationship between pledging allegiance to both God's kingdom and earthly kingdoms—that's why I wanted to study political science and criminal justice. What do you appreciate about your academic experience at Northwestern? Professors set the bar high and encourage students to wrestle with tough questions. Both the criminal justice and political science departments offer a great deal of personal connections and real-world experience. In addition, the professors do a great job maintaining neutrality on various topics we discuss in class while also stressing principles in keeping with the kingdom of God. They purposefully keep their own political opinions private and challenge students to think for themselves. Describe your semester in Washington, D.C. I participated in the Council for Christian Colleges and Universities' American Studies Program, so I took classes while also interning at the Department of State. In addition to learning the functions of my office and exploring other bureaus, I also attended Secretary of State Mike Pompeo's congressional testimony and saw Justice Ruth Bader Ginsburg when she visited the State Department. What job performance feedback are you getting from your State Department supervisors? I've been complimented on my efficiency, my attention to detail, and my ability to learn new things quickly. I show up every day on time with a good attitude and try to demonstrate pride in my work and be a good teammate to my coworkers. I feel like values like those get noticed. Beyond your education, what else did you value about your Northwestern experience? I will forever cherish the people I met while at Northwestern—in the dorms, in classes, on Spring Service Partnership mission trips, and through intramurals and tutoring. Attending a Christian college alongside friends who follow the same God is quite remarkable.